The screech of a peacock shatters the peaceful night, warning other peafowl that a predator is nearby. Whether wild, feral or raised in captivity, the Indian blue peafowl (Pavo cristatus) is the best known of the three peafowl species. While the males, or peacocks, roost in trees, the peahens are hidden under shrubbery, nesting in scraped holes in the ground. 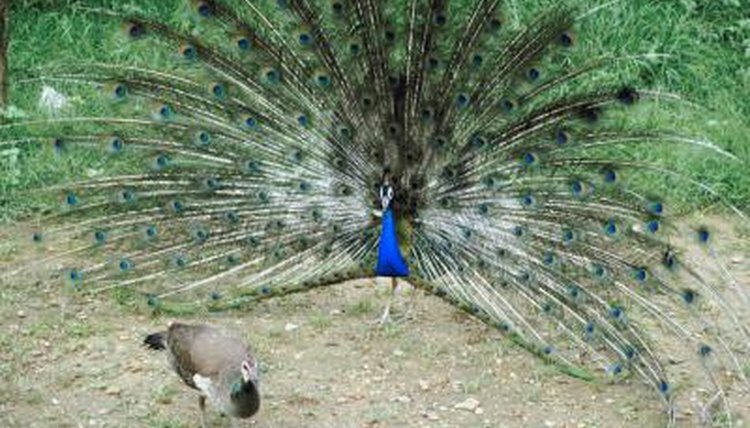 The prancing, dancing, tail-shaking mating dance of the male peacock is designed to attract the attention of the peahens. A peahen chooses her mate by the size of his display and the number of eyespots on his train feathers. A healthy, mature male has more eyespots on his feathers than younger, less healthy peacocks. In addition, a strong peahen will fight off other hens who might compete for the attentions of her selected peacock. When building a nest, a peahen scrapes a hole in the ground under a shrub or in a thicket. Then she lines the hole with leaves and sticks. Occasionally a peahen builds a nest in a tree, usually because of predators in the area. While a peahen usually lays only one clutch a year, if the eggs are removed from the nest by humans or other predators, she may mate and clutch up to three times in a single season. The peahen sits on her three to twelve eggs for 28 to 30 days, leaving the nest only to hunt for food, including termites and other insects, small snakes, seeds and fruit. The male bird doesn't participate in the brooding or feeding of the peachicks -- the peahen does all the work of raising them. When the peachicks hatch, they're fully feathered and able to walk. Within two weeks, the chicks can fly short distances, allowing them to fly up into the branches of the roost tree. While the peachicks are able to forage for food and fly within two weeks, they stay with their mother for at least seven to nine weeks and often longer. By two months, the peachicks, both male and female, are small look-alikes of their mother. The female peachicks begin laying a few eggs at 2 to 3 years of age, while the males require two to three years to mature and three years or more to develop a full train of feathers.